Beau came to me yesterday from Blacktown. Beau was suffering complete loss of the use of his back legs. Bowel actions plus urination had seemingly lost control. He had no control of the tail and was not even able to wag the tail. He possibly suffered a fall injuring a lumbar disc it seemed to be L 4/5 . Beau had 2 visits to the Vet. 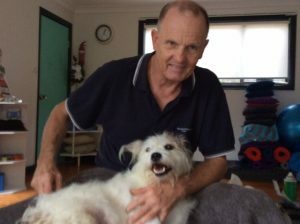 Surgery was recommended at a cost of $8,000 .The Blacktown vet Dr Russ Dickers suggested that Beau see a Chiropractor first. Wendy and Billy, Beau’s owners drove to MONA Vale to have a treatment . On exam I observed an inability to walk and a loss of bowel control. Motion palpating of the back revealed a lumbar disc lesion at L4/5 with a subluxation. Acupuncture was done to the lumbar spine using bladder points and adjustments to the lumbar spine L5 and the RHS Psis which was P.I. I also used cold laser to the lumbar spine. Wendy reported Beau slept all the way home and on arrival at home he walked into the house and was wagging his tail. I have recommended full rest, meaning no activity, and a follow up treatment on Saturday . We regularly give you updates from our Chiropractors: Neil, Mitchell, Maggie and Adam. The Chiropractors Blog covers any recent courses that our Chiropractors have attended and feedback on treatment techniques they have found effective as well as topical suggestions to maintain optimal health. Disc injuries, what actually happens? Is it safe to exercise when you have the cold/flu?